If you like dinosaurs, you’ll want to check out the Dinosaurs Alive! attraction at Kings Island in Ohio. 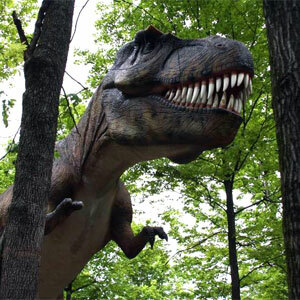 More than 60 life-sized dinosaurs are on display, including 56 animatronic models, in an outdoor Jurassic forest setting. As you stroll through the 4,000-foot long path spread over 12.5 wooded acres, you might feel like you’ve traveled back in time to periods between 245 million and 65 million years ago. From the short video I saw, the larger dinosaurs, such as the T-rex and brontosaurus, are pretty impressive. The triceratops has wobbly horns, but other than that the artistry is good. Each of the animatronic dinosaurs is hand-carved and covered with skin-like materials. 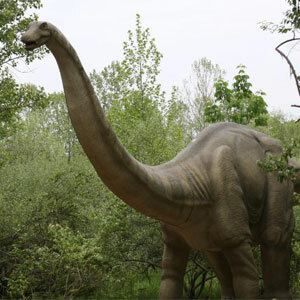 The attraction, billed as the world’s largest animatronic dinosaur park, is comprised of six main scenes and nine thematic exhibits. Highlights include the vicious-looking Irritator and its cousins the Baryonyx and the Spinosaurus, the lizard-like Stegosaurus, the meat-eating Tyrannosaurus Rex, the three-horned Triceratops and the flying Pteranodon. Four of the dinosaurs have interactive consoles which allow you to guide dinosaur movement so you can see how scientists believe each dinosaur moved its arms, tail, mouth and eyes. There is also a replica of an excavation site, a kids’ paleontological dig site where you can uncover prehistoric fossils, and a 1,500 square-foot dinosaur-themed gift shop. The dinosaurs, which are scientifically accurate based on the latest paleontological knowledge, were created by the Canada-based company Dinosaurs Unearthed. Open daily through August 28 from 10 am until dusk. Opening and closing times vary in the fall. Not included with general park admission or season pass. A separate admission ticket of $5 is required for this attraction.